There is a lot to look at when renovating a bathroom. There are regular unexpected problems and the cost price is often higher than expected. In this article, you will learn how to make the bathroom renovation work fast and how much you can renovate. A Good Start is Half the Battle! For the renovation work to be smooth and pleasant, you can carry out a lot of preparatory work. Prepare a schedule and check what needs to be renewed and how much this will cost. This prevents unforeseen costs, loss of time and annoyances once the work has started. With the step-by-step plan below your bathroom renovation will be a lot easier. If you only have one bathroom, it is important that renovation work well. Try to purchase and store as many materials as possible before breaking out of the bathroom. You sometimes have to skim a lot of shops before you find the perfect piece of furniture. Usually, you have to wait a few weeks for the delivery. Now that the bathroom has broken out, you can easily check whether the supply taps and drain pipes are still working properly. If you see scale formation or do not open the taps, then you should replace them better immediately. In this way, you will not face unexpected problems within a few years. The cost price of a new bathroom depends on two important factors: the choice of materials and furniture and whether you renovate or renovate yourself. The figures below give a good indication of the cost price. Keep an eye on! Installers often only place the bathroom you buy through them. This is to prevent later discussions about quality and materials. Qualitative ceramic tiles start from $25 per square meter and can quickly reach $100. For a correct cost estimate, you can count on an average of $60 per square meter. If you want to have the tiles installed, another $50 per square meter will be added. An average bathroom furniture costs between $700 and $2000. The price of the installation is approximately 20% of the purchase price. You can reduce the costs of the renovation by breaking out the furniture yourself. The price of sanitary can vary considerably depending on the difficulty of placement, use of materials and technical gadgets. For a basic bathroom, you can count on a budget of $2500. This amount can quickly amount to $7500 or more. 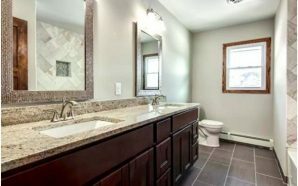 You can count on a budget of $ 10,000 for placing a completely renovated basic bathroom. If you want to use high-quality materials, place new gadgets or replace boilers and pipes, you need a budget of $ 25,000 quickly. Pay attention to the budget and do the renovation itself, you can already place a new bathroom for $ 5000. Bathroom Renovation: Comparing Practitioners pay off! Is your bathroom ready for renovation? Through our online quotation service, you can now request prices without obligation from professionals specializing in bathroom renovation. Comparing materials, achievements and prices have never been easier! Request prices and proposals without obligation via the online form available. Using the online form, you can request quotes online from registered professionals who specialize in general bathroom work, tiling, and plumbing. The best quality at the best price: Comparing materials, achievements and prices have never been easier!